The dining scene in Taiwan has recently been inaugurated by the international renown bible of cuisine guide, The Michelin Guide. 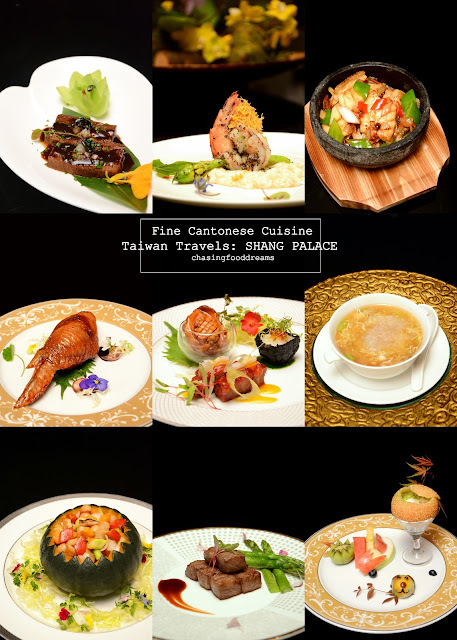 And it’s about time too… as Taiwan is a renowned for their epicurean cuisines. My Taiwan travels continue in Taipei as we made a visit to the elegant and luxury 5-star Shangri-La’s Far Eastern Plaza Hotel to savor an exquisite Cantonese epicurean journey of flavours. Shang Palace was recently awarded The Plate Michelin by the Michelin Guide this year among the prestigious 99 restaurants list. We entered Shang Palace, the realm of the elites where gourmands dine in fine pleasures of Cantonese cuisine set in modern Oriental environment. Opulence are everywhere, from the moment one steps into the path leading to the restaurant, to the moment one opts for their two themes dining scene of celestial clouds or the peony flower. One feels the adrenalin rush of excitement while being led through a maze of Oriental vibes, brought up to the modern era of today’s gastronomy scene. We pass the celestial clouds dining area and couldn’t resist a peek into the fine dining room, beautifully designed with simple sophistication of dark wood lifted by whites and splashes of gold. The ceiling of the room is emblemed with the celestial cloud motif to depict the whole theme of its design. We pass another hallway, this time down-to-earth with warm glow lights leading us to the end of the tunnel where light prevails. It is here where all the private rooms are set. Mostly minimalist with grandeur, the private rooms hold up to quite a few parties. Modern contemporary furniture with classic table settings are seen in all the rooms. The gold, cream and black theme continues through the table setting, reminding us of how the East favors gold as their note of luxury. We met with Executive Chinese Chef Chan Kwok Wah, humble and soft-spoken. Chef Chan, a Hong Kong-born master chef with over 30 years of experience, has been working in the kitchens since his early teens. Before joining Shang Palace recently, his previous stints include various Michelin Star restaurants in Hong Kong such as Shang Palace at Shangri-La Hotel Kowloon and Hong Kong Liyuan Restaurant. Garnering his skilled Chinese cooking techniques from other famous eateries, such as Donghai Seafood Restaurant, Maxim's Restaurant and Fudong Restaurant, has enriched his repertoire of Cantonese signature dishes through his culinary years. When asked on his motto of being a chef, Chef Chan replies modestly with “Keeping to self-principles and doing every dish.”. He abides by his own six core principles of freshness, hygiene, safety, exquisiteness, benevolence and creativity when it comes to his cooking. With the evolution of gastronomy, Chef Chan believes that Chinese cooking is shifting to modern single plating affair while retaining the classic flavours of yesteryears through classic and new ingredients. Shang Palace offers Personal Set Menu as well as A la Carte Menu where diners can opt of chef’s 7-course specials or savor individual signatures. We had the honors of trying the Personal Set Menu as well some few other a la carte signatures. Our individual Personal Set Menu commenced with a fine plate of trio of appetizers, showcasing Chef Chan’s creative interpretation of classic Cantonese dishes. Using the finest black pig, the Barbecue Iberico Pork with Mullet Roe in Passion Fruit Sauce is a moreish rendition from Chef Chan. The flavours are distinctively ‘Char Siew’ and yet the addition of fruity passionfruit tang balanced the rich meaty sweet notes with the salty mullet roe. The Fried Conpoy in Spinach Sauce had a fresh and plump scallop wrapped with seaweed and paired with a spinach sauce. The scallop was juicy and beautifully sweet while the globules of salmon roe added a delicious briny finish. The third appetizer was a lavish abalone, glazed in a caramelized sticky sweet and savory sauce. Tender and tasty, one cannot help but to indulge happily at this beautiful mollusk in Chilled Abalone with Jelly Fish. There’s also a spicy crunchy jellyfish salad beneath the abalone. Cantonese cuisine are known to place much importance on soup course. In fact, most families would have at least a soup in all their meals. Every spoonful of Shang Palace’s Braised Bird’s Nest Soup with Alaskan Crab Meat is sublime. Thick broth filled with luscious essence of the sea followed by beautiful soft textures of bird nest and sweet crab meat flesh. The Beef Ribs with Black Garlic took hours to make but was gone in a few pleasurable minutes. Chef Chan took us back to the kitchen to give us a demo of this dish and his cooking finesse was impressive. Making it look so easy but we all know it was a skill set that was garnered over many years of slaving over the stove. The beef was braised for hours till fork tender in its own jus. It was then finished up with a steaming process and then sauced up with a piquant black garlic sauce, minced onions and chives and a tiny piece of soft creamy black garlic. For a lighter touch in between heavier courses, the Braised Whole Tomato filled with Fresh Lily and Cordyceps in Chicken Broth was delightful. Soft and sweet whole beefsteak tomato is stuffed with fresh creamy lily bulb, jelly cubes of broth and Jinhua ham. Finished with a thicken sauce on a bed of soft sautéed greens, the dish is creative and light even with so many ingredients. Chef Chan’s Deep-Fried Chicken Wing filled with Glutinous Rice is one of the most popular signature dishes at Shang Palace. The clever classic dish of yesteryears is perfectly executed from its presentation to the flavours and textures. The set menu ended with this pretty plate of desserts. From the adorable doggie shaped mochi to the golden sesame encrusted glutinous rice ball filled with hot nutty almond sweet broth, dessert was a medley of colours, flavours and textures. The pairing of intense green tea with the almond flavour was rather a bold risk but it paid off as the flavours work harmoniously well. Besides the Personal Set Menu, we savored four other A la Carte signature dishes from the menu. 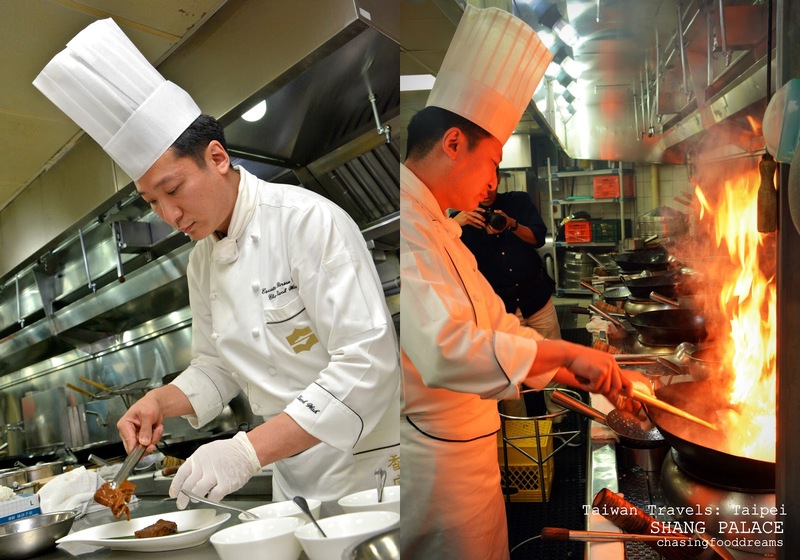 Many epicureans are said to visit Shang Palace just for their Roasted Duck. Ours was stunning at sight. Gorgeously evenly lacquered, the duck skin glistened with deliciousness. Carved at tableside, the chef’s quick carving skills separated the Roasted Duck into a plate of crispy skin and another place of skin and duck meat. Served together steamed pancake, thin batons of cucumber and spring onions as well as hoisin sauce, both platter of Roasted Duck looked utterly delectable. The duck skin is crispy and not fatty or oily at all, denoting the fat of the duck well-rendered under skillful roasting technique. The meat, tender and moist, had a lovely aroma and flavour with subtle herbal notes. When savored all together with the condiments, the Roasted Duck is a masterpiece. The first bite of the thick and tender garoupa fillet was deliciously pleasant. Delicate sweetness with moreish nutty notes, the fillet is cooked well and the accompaniments of the crunchy vegetables balance up the robust sauce well. The finest ingredients and skilled technique are the highlights of the Pan-Fried Beef Tenderloin with Asparagus. Marbled tenderness with sublime flavour, the cubes of beef is a joy to eat. There is a wondrous smoky aroma on the beef that enhances the flavour. It may looked rather simple but rest assured, it a dish that one would indeed return for. The Sautéed Assorted Vegetables Served in Pumpkin features a garden medley of crisp and crunchy sweet vegetables and pops of nutty macadamia nuts. Colorful and tasty, the dish is very light and enjoyable. *This trip was made possible by Taiwan Tourism together with First Class Magazine and Eva Air. However, all stories and comments in my posts are purely derived from my own experiences through the trip.